Second Skies is a virtual aviation company, making airship and aircraft simulations for the virtual world of Second Life. Please check out our website for our current models, available for purchase at our main store in the Skies of Tomorrow sim. We also do custom work, contact Gaius Goodliffe if you're interested. 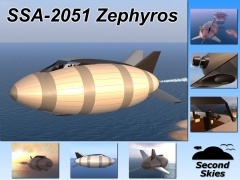 Another new airship launched today: the SSA-2051 Zephyros. This unusually styled airship features a top-side cockpit and bottom-side chrome air scoop for its rear-mounted jet engine. Definitely a break from the ordinary. Also, a couple days ago I added the SSG-01 Vulturnus Flight-Assist to the product lineup. Just the thing if you're looking for a good jetpack with a bit of a retro feel. As always, test-flights and demos are available at the store in-world. Check it out! Our newest airship launched on March 31st, 2008. 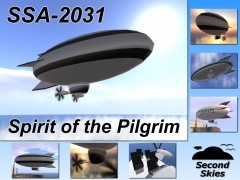 The SSA-2031 Spirit of the Pilgrim is named in honor of Goodyear's first blimp, the Pilgrim. It's the first of our next generation of airships, with a complete overhaul of our scripts. Highlights include camera control and a new improved autopilot with greater accuracy, ability to give preprogrammed tours, and web integration!